James Blyth, pictured left, of St Andrews leads the field at half way in the 97th Scottish men’s students golf championships at the Moray Golf Club's Lossiemouth links, thanks to a swashbuckling round of 67 over the New Course. Blyth's colourful card featured an eagle at the par 5 third, plus five birdies - including a hat-trick starting at the 13th. James thus posted the joint best round of the tournament to enjoy a three-stroke lead with two rounds to go. However he suffered a series of unfortunate events over the next six holes, dropping seven shots to par over this stretch. McDougall finds himself just one shot behind first-round leader Oliver Bailey, who had a topsy-turvy round – including just a solitary par on the front nine – to finish the day in third place on a total of 144. Stirling stablemates Michael Lawrie and Matthew Bell round out the men’s top five, but they will all be chasing the man from St Andrews, James Blyth when play resumes. 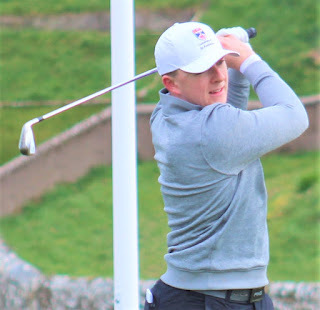 The top half of the men’s field will play the last two rounds over the Moray club's Old Course on Tuesday, with their sights set on securing the Jack Allan Cup for the champion student golfer of the year. The female students were first out into the stiff morning breeze for what proved to be an absorbing day of golf. 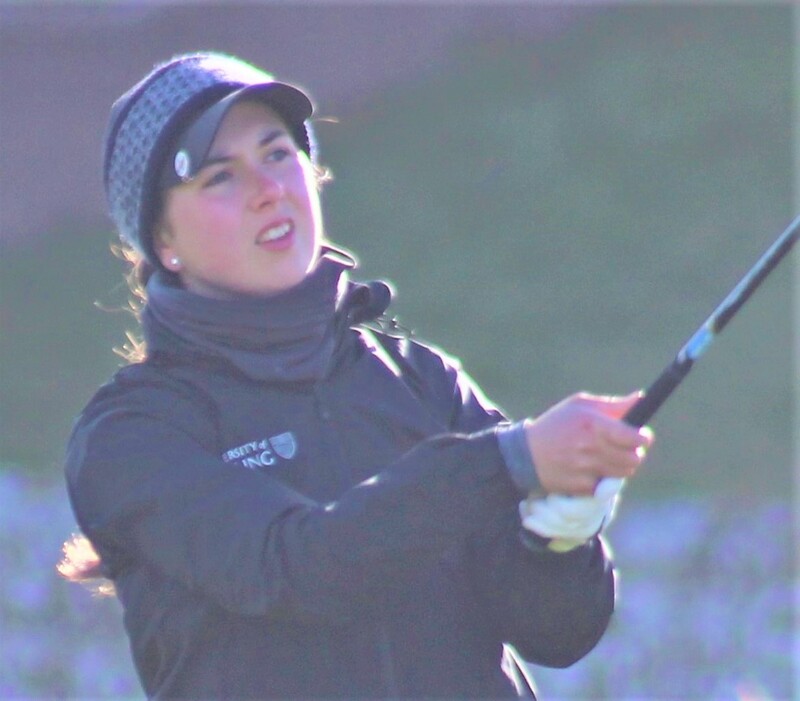 Stirling University’s Penny Brown (pictured left) continued her very useful form with birdies at the sixth, ninth and 12th on her way to a very healthy 73 and a leading 36-hole total of four-over 150. 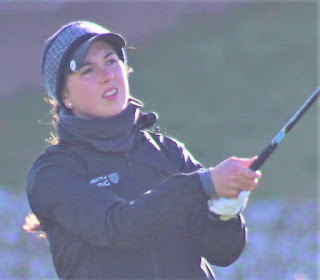 This placed her just ahead of overnight leader Chloe Goadby (Stirling), who never quite found her first-round form and stuttered slightly to a round of 75, with only a solitary birdie at the 13th to smile about. Nevertheless Goadby remains only one shot back and with everything very much to play for over Tuesday's 36 hole finale. The top three at the halfway stage is rounded out by Lorna McClymont from SRUC, who posted a very impressive 70 to spring up the leaderboard and finish the day two off the lead. McClymont had an up and down day but showed great tenacity to fire three birdies in her closing five holes, including a 3 at the last that was set up by a wonderfully controlled approach shot to six feet.Also making the cut, amongst others, were Alexa Hammer (St Andrews), Caitlin Boa (UHI) and Susan Woodhouse (Strathclyde), meaning that six institutions will be represented across the top ten. Play resumes on Tuesday morning over the New and then the Old Course, in pursuit of the title and the much coveted Smith-Murray Cup. 152 L Fraser (Stirling) 79 73, C Leith (RGU) 79 73,C Franssen (St Andrews) 77 75, A Reid (Strathclyde) 77 75. 157 G Minton (UHI) 83 74 (5 other players on 157 failed to be included in the 39 players to beat the cut). +39 players with totals of 157 and better beat the cut.